This article was first published on the Australian Garden History Society website, on the 7th of April, 2014. You can download the original pdf here. Having just celebrated Canberra’s Centenary year in 2013, this year, 2014, marks the semi-centenary of the official inauguration of Lake Burley Griffin and its parklands. After fifty years of Lake Burley Griffin’s presence in the nation’s capital it is timely to reflect on the visions that created the exceptional lake parkland feature, the appropriation of lakeshore public spaces and the bleak reality of the lakeshore’s protection and future. By the 1970s Canberra was recognised as a model expression of best planning and modern landscape design. The development of the lake and its foreshore landscape was the largest and most comprehensive designed landscape in Australia and still is. 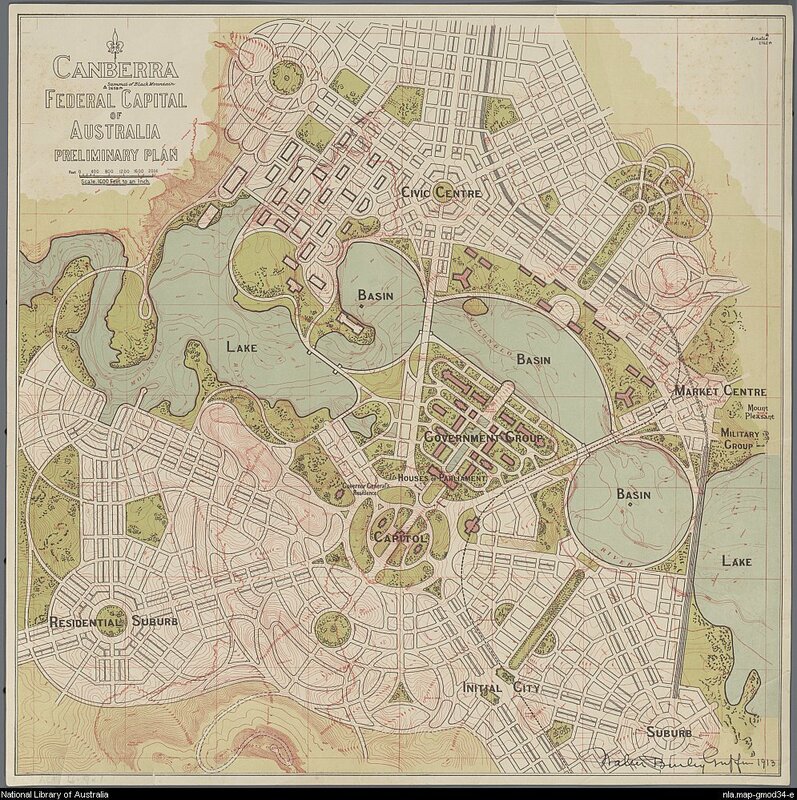 The ingenuity of Walter Burley Griffin’s vision at the time he created the Canberra Plan was refreshing and different. Griffin had studied architecture and as well, forestry and horticulture. He was widely read and familiar with contemporary works in architecture and town planning as well as English and Japanese landscape designs (Griffin 2008: xxi). However the strong influences on Griffin’s style were his own countrymen, through their writings, lectures and works such as the social reformer, Henry George, the architect planner Daniel Hudson Burnham Director of Works for the Chicago Exposition, the architect Louis Henri Sullivan and Frederick Law Olmsted, the father of the American landscape movement (Griffin 2008: xxii-iv). Working with Burnham on the Exposition was the landscape planner, Frederick Law Olmsted. At that time Olmsted was seventy and had an impressive design portfolio of works that included numerous city landscapes, most famously Central Park, New York. Olmsted entered his landscaping career after being a social journalist and farmer. He was widely travelled in his homeland and also in Europe. He was an admirer of the British ‘picturesque’ aesthetic landscape appreciation and the written works of Uvedale Price, William Gilpin and Humphrey Repton (Beveridge 2000). Olmsted impounded local water courses to create lakes and ponds and his work profusely demonstrate his love of nature with his restoration of natural marshes and fens, arboreta of forests, naturalistic shapes, meadow like spaces, field flowers, clumps of greenery and picturesque incidents. Olmsted’s views stemmed from what he termed the “elegance of design” – the creation of a composition in which all parts were subordinated to a single, coherent effect with a purpose to give people greater enjoyment of scenery. In his landscape designs he promoted native as well as exotic trees for colour and tone, enriching nature in a naturalistic way. He noted his dislike for the hybridised, decorative fashionable plants and arrays of garden toys, as would have been prevalent in the contemporary European ‘gardenesque’ style (Zaitzevsky1982: 21, Rybczynski 1999: 362). When he retired in 1895 he had 550 landscape works to his credit that included national parks such as Yosemite, urban parks, campuses, private estates, and the Riverside suburban community, Chicago. Echoes from Olmsted can be found in Griffin’s central water-system that reflects Olmsted’s use of impounded local watercourses surrounded by urban parklands, such as the Emerald Necklace, Boston, a linear linked parkland, designed in 1880 (Figure 2). Another Olmsted feature –a continuous irregular green reflection outlining the water can be discerned on Marion Mahoney Griffin’s 1911 prize-wining perspective drawings showing the lake. Griffin’s coherent central lake parkland composition that was further developed during 1914-1918 incorporated arboreta, coloured foliage for effect, naturalistic areas and formal parks arranged around impounded waters and reflect an Olmsted influence. 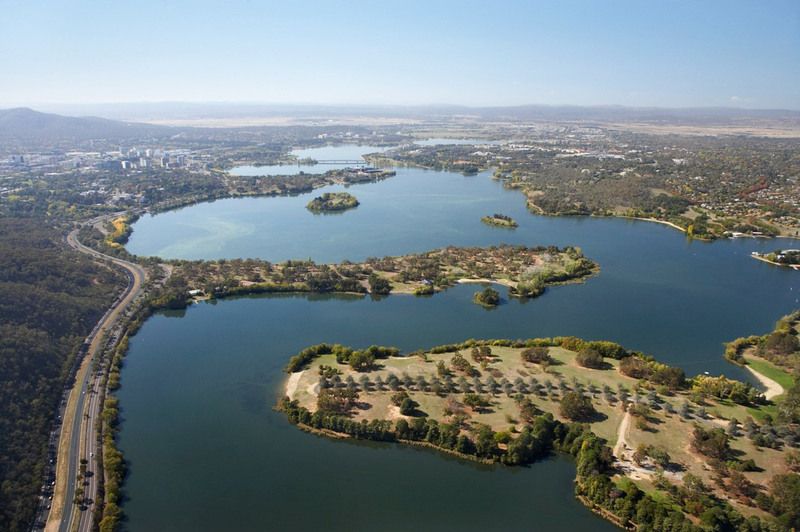 The site chosen for Australia’s capital city had ample waters for a lake from the Molonglo and Queanbeyan Rivers to the east and Jerrabomberra Creek from the south. The Molonglo river flood plain was perfect for the lake as it had a natural amphitheatre of hills that gave protection from the north, south and west. With his land and water axes Griffin drew the mountains into Canberra’s central water basin and overlaid a triangular city framework between the vertices of three hills. Griffin’s lake plan was for two naturalistic lakes, East Lake and West Lake linked by three formal basins in the central area, all forming the water system that flowed across the heart of the city (refer Figure 3). His intention was to ‘retain the surrounding hills in their natural state as nearly as possible, as parks and forest and game preserves and as the termini of the principal axes of as many important vistas as possible’ (Gray 1999: 79). Griffin always regarded himself as a landscape architect, was a member of the Naturalist Society of New South Wales and a champion of Australian native gardens (Griffin 2008:305). However, Griffin must have been disappointed when he first saw Canberra’s barren degraded surrounds. After a century of European settlement the Canberra landscape had undergone ring-barking and clearing, rabbit invasions and overstocking, that resulted in gully, sheet and stream erosion of the alluvial soils on hill slopes and ensuing siltation of rivers and creeks (Gray 1999: 59-60). A tactful 5 comment in Griffin’s 1913 report to the Home Office on the location of a botanical garden, notes the general lack of native bushland ‘..Black Mountain, incidentally perpetuating there the only primeval luxuriance on the city site.’ (Griffin 1913:7). The preliminary plan (Figure 4) that accompanied the report well illustrates the lake landscaping as settings for major cultural buildings in the central basin area and having large segments of landscape adjacent to both East and West Basins. Landscape parkways were delineated, linking the forested city hills and mountains to the lake; the parkways (named in the 1918) plan as Prospect Parkway (now Anzac Parade) and Waratah Parkway (now Telopea Park), Black Moutain Peninsula park and an extensive landscape domain extending from Capital Hill to Blue Gum Point in West Lake (now reduced and known as Stirling Park). Between the time of Griffin’s prize winning plan and his arrival in Australia to take up the position of Federal Capital Director of Design and Construction in 1914, tree planting testing had been advocated by Thomas Charles Weston, appointed in 1913 as afforestation officer (Gray 1999: 62). Griffin and Weston differed on tree species selection and planting priorities although they both agreed to fencing off the city hills from grazing. By 1915 Griffin developed a concept plan for a continental arboretum extending into his planned botanic garden at Black Mountain, to contribute to the ornamental and recreation setting of the city and be important for education. The southern continents interpreted on the southern lake peninsulas have been suggested as reflecting the Gondwana links (Vernon 1996; 98). Weston wished to reserve the land delineated by Griffin as the continental arboretum and plant it with nurse trees as a temporary arrangement but Griffin insisted on the immediate establishment of a large scale cork oak plantation as a commercial landscape venture (Gray 1999: 85-88). It is possible that the circular plots of eucalypts remaining in Weston Park today, some of which were planted in Griffin’s time (and can be seen on Figure 9) were preliminary to the Australian section of the arboretum planned for that area. 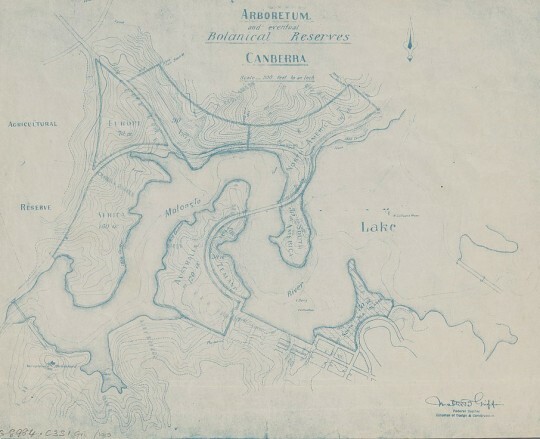 The 1918 Canberra plan by Griffin includes the continental arboretum. 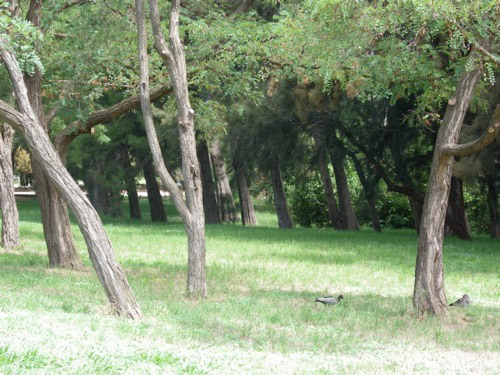 Griffin initiated Cupressus and Cedrus spp. plantings on bare hills on the western reaches of the lake and the more controversial plantation of Redwoods at Piallago that was to be East Lake Park (Gray 1999: 95-98). These two groups of plantings would have given the lake strong dark evergreen terminal parks at the eastern and western extremities. In 1920, after six years of enduring obstacles created by bureaucrats and politicians, Griffin resigned from his government position in December (Kabos 2006-14). Many variations to the Canberra plan happened in the interwar years including the suggestion to reduce the lake to three central basins. It was not until after World War II that the Menzies government had the resources and determination to reinvigorate Canberra’s development with advice from Lord William Holford, a British planner. In1957 Holford recommended the construction of the lake, although a lake greatly reduced from the Griffin original, with the elimination of East and West Lake waters. The central parkland was also reduced with the introduction of a motorway. Luckily the West Lake area was saved from its elimination by the presence of cavernous limestone at the weir crossing proposed by Holford (Butz 1987). The National Capital Development Commission (NCDC) was established in 1958 to manage Canberra’s development. Lake works commenced in 1959. By 1963 the massive structural works were constructed and a landscape master plan for the lake and parklands drafted (Figure 5). Scrivener Dam gates were closed in September 1963. Following an extended period of drought in the Canberra region, uncommonly heavy rain fell in the catchment and the lake filled reaching its impoundment level at the 556m contour just six months after the closing of the dam’s gates. After years of noisy lake construction, the silently but quickly filling lake amazed Canberra residents with its beauty and the way it consolidated the sprawling city. Despite the excision of East Lake from the original plan, a lake with a strong semblance to Griffin’s plan was miraculously achieved. During the last fifty years the lake parklands have developed with designed formal garden areas, informal and naturalistic parks and wetland environments. There appears to be set land use areas delineated, such as for service infrastructure, commercial yacht clubs, a boat harbour for commercial vessels in Kingston, and a scattering of restaurants. Arboreta, as part of Griffin’s design were progressively established, commencing in the early plantings at Westbourne Woods and Weston Park. In the mid 1950s, under the direction of Lindsay Pryor, a substantial arboretum at the western end of the lake was established and in 2001 was named the Lindsay Pryor National Arboretum. Recently, the new National Arboretum Canberra, the unique centenary gift to the city by the Australian Capital Territory (ACT) Government, was commenced on the hill slopes, over the site of former pine plantations that had been devastated in the 2003 bushfire. The new arboretum described by Max Burke (AGH, 24 (4): 23-27) provides stunning views along the east west axis of the lake and an extensive forest park background to the lake system. Recent road realignment has created a connection between the two national arboreta so that there will be a continuum of arboreta from the lake to the hills. With its urban forests, native woodlands, open grasslands and formal parks, now well habited by water birds, the lakeshore provides a series of intimate and extensive landscape experiences, loved by the Canberra community and visitors. Although diagrams of the land use zones are in the National Capital Plan, and many individual park master plans along with a few individual heritage management plans have been prepared, the last coherent illustrative master plan of the lake as a complete lake and parklands system appears to be the NCDC plan of 1963 (Figure 6). During the last two decades Canberrans have witnessed the piece-meal appropriation of the lakeshores for an extensive array of apartment blocks, a hospice, an abundance of memorials in the central area, along with a continual string of lakeshore proposals such as huge war memorials, a prime ministers lodge, apartments blocks and hotels. Such developments whether completed or proposed exploit the aesthetic value of the lake absorbing its scenery as their own and returning nothing but blighted vistas from other areas of the lake. Despite the policies of the NCP the lakeshores are losing their open spaces and public access. The green foliage fringe that separated the central waterscapes from city structures has been obliterated in areas such as Kingston. Most recently a proposed commercial boat maintenance complex has been moved from its original planned location at the Kingston boat harbour to the tranquil naturalistic area of Black Mountain Peninsula. The relocation of the industrial complex to the peninsular parkland, purported to protect the Kingston residents from occasional industrial noise, provided the ACT Government with considerable funds from the sale of the Kingston site to developers. Despite well considered submissions against the Black Mountain Peninsula location, particularly by the Walter Burley Griffin Society (Weirick 2014), the peninsular location was selected for the development primarily as it was the cheapest development option. 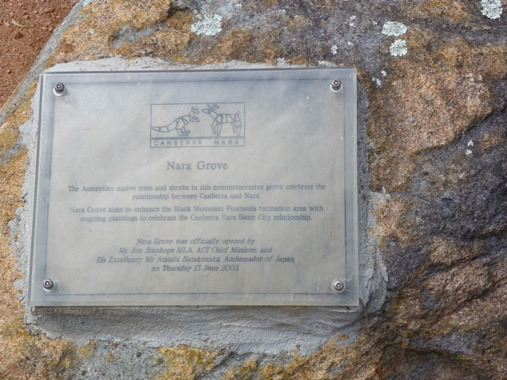 On the low ridge in Black Mountain Peninsula, a commemorative group of plantings that celebrate Canberra’s relationship with its sister city, Nara, will now overlook the boat maintenance industrial complex with its security fencing and lighting, rather than the park landscape fronting the lake. Twenty trees in the proposed site are to be removed. The complex is an unnecessary damaging impact to an area that provides a naturalistic edge to the lower West Lake reaches of the lake system. Despite policies outlined above, Black Mountain Peninsula Park, an established open space area, has not been protected, reflecting the inadequacy of both the NCP policies and the ACT Government’s appreciation of the park’s aesthetic and social community values. The Olmsted Parks have also suffered over the years, becoming degraded and at times unsafe. The Emerald Necklace in Boston is the only remaining intact linear park. Others have been and continue to be subject to impacts such as the expansion of zoos and roads cutting through the landscapes. However, advocacy to save and restore the parks is well established and successful. The National Association for Olmsted Parks established in 1910, undertakes intense advocacy to prevent inappropriate developments, prepare master plans and reestablish all manner of landscape features (http://www.olmsted.org/advocacy/current-advocacy-work). Ken Taylor, in his book, Canberra the City in the Landscape, described Lake Burley Griffin as Canberra’s greatest glory and noted that the former NCDC head, John Overall claimed the construction of the lake and parklands as the NCDC’s most significant project (Taylor 2007:133). Now, fifty years on there is no effective protection of the coherent lake and parkland’s system and instead we are witnessing incremental developments large and small that are damaging the lake-shores open spaces and the glory of the lake. In Australia, a community group dedicated to the protection of Adelaide Park Lands sets a fine model for community advocacy and landscape conservancy. The group was established in 1869, has undergone some name changes but has maintained continuous vigilance in landscape protection of the park lands for 144 years. It is currently known as the Adelaide Park Lands Preservation Society (http://www.adelaide-parklands.org/). Adelaide Park Lands has also been recognised for its outstanding heritage significance and listed on the National Heritage List. To protect Lake Burley Griffin and its lakeshore parklands, the Australian Garden History Society needs to take on advocacy and conservancy by initiating a group of Lake Burley Griffin lakeshore guardians. This may require setting up a web site, developing strong links and support with all interested community groups, demonstrating the historic, aesthetic, social and economic values, liaising with the media, working with the management agencies, taking every opportunity to submit comments on inappropriate development, encouraging the development of master plans and maintaining archives. For Lake Burley Griffin and Lakeshore Parklands, advocacy and conservancy is urgent. Beveridge, C. (2000) “Olmsted his essential Theory”. From the National Association for Olmsted Parks. http://www.olmsted.org/the-olmsted-legacy/olmsted-theory-and-design-principles/olmsted-his-essential-theory (accessed 5/2/ 2014). Butz, M. (1987) “The Lost Karst of Canberra”. Paper presented at the 22nd Annual Conference of the Institutes of Australian Geographers. Canberra. Gray, J. (1999) TCG Weston (1866-1935), Horticulturalist and Aboriculturist. Thesis, for the Degree of Doctor of Environmental Design, University of Canberra. Griffin, D. (ed) (2008) The Writings of Walter Burley Griffin. Cambridge University Press. Griffin, W.B. (1913) The Federal Capital, Report Explanatory of the Preliminary General Plan. 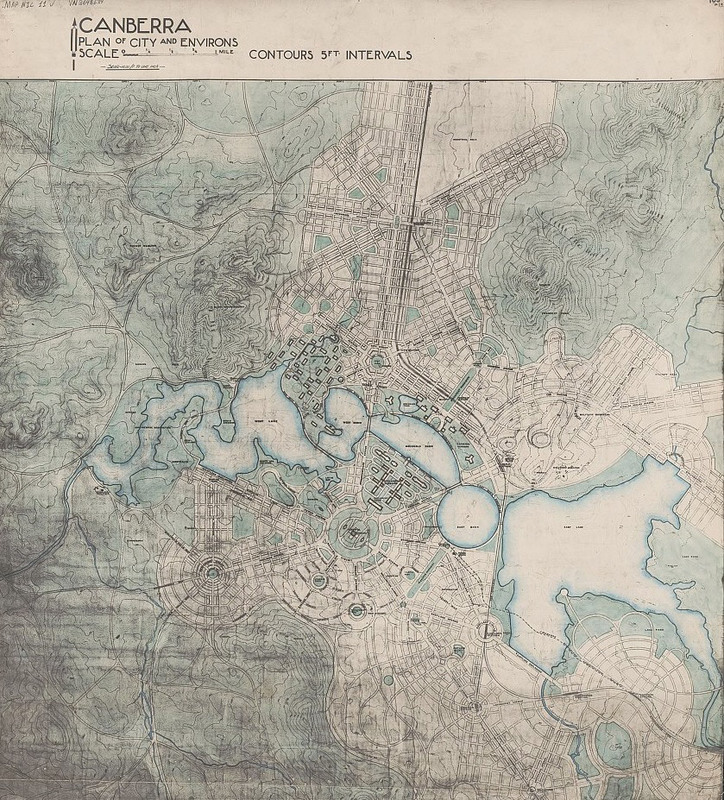 Report for the Department of Home Affairs Commonwealth of Australia to accompany the 1913 plan of Canberra. Firth, D. (2000) Behind the Landscape of Lake Burley Griffin: Landscape, water, politics and the national capital 1899-1964. Thesis, for the Degree of Doctor of Philosophy. University of Canberra. Kabos, A. (2006-14) ‘Walter Burley Griffin’. Walter Burley Griffin Society Website. http://www.griffinsociety.org/Introducing_the_Griffins/wbg.html (accessed 15 March 2014). Menzies, R. (1964) Inauguration of Lake Burley Griffin Canberra ACT. Speech by the Prime Minister the Rt. Hon. Sir Robert Menzies. National Trust of Australia, (2010) Our Heritage at Risk. http://www.heritageatrisk.org.au/Shores_of_Lake_Burley_Griffin.html (accessed 5/2/2014). National Association for Olmsted Parks http://www.olmsted.org/advocacy/naop-advocacy-role (accessed 6/2/2014). Reid, P. (2000) Canberra Following Griffin: A Design History of Australia’s National Capital. National Archives of Australia. Rybczynski, W. (1999) A clearing in the distance: Frederick Law Olmsted and America in the nineteenth century, Scribner, New York. Taylor, K, (2007) Canberra, City in the Landscape. Halstead Press and the National Capital Authority. Vernon, C. (1996) ‘The Landscape Art of Walter Burley Griffin’. Watson, A. ed. Beyond architecture : Marion Mahoney and Walter Burley Griffin : America, Australia, India. Powerhouse Publishing, Hay Market, NSW. Zaitzevsky, C. (1982) Frederick Law Olmsted and the Boston Park System. Belknap Press, Cambridge, Mass.